USB-C uses a convenient reversible plug that connects every time and supports the fastest data speeds available on USB. It also offers faster charging than other USB form factors thanks to higher wattage. ADATA makes sure you enjoy the full benefit of USB-C with a durable cable that features a protective sleeve to prevent interference and data loss. We use the finest materials, ensuring the cable can withstand bending, twisting, and pulling. The simple act of connecting a USB plug testing your patience? No more with USB-C, which is completely reversible. There’s no up or down, it connects every time, the first time. There’s no wrong position, and as a big benefit you also get much faster data speeds and device charging. USB-C is becoming the new standard on notebooks, tablets, smartphones, power banks, and many other devices. SB-C supports much bigger bandwidth than previous USB connection types. Waiting around for big files to transfer is no longer a problem as everything moves faster between devices thanks to doubled performance. 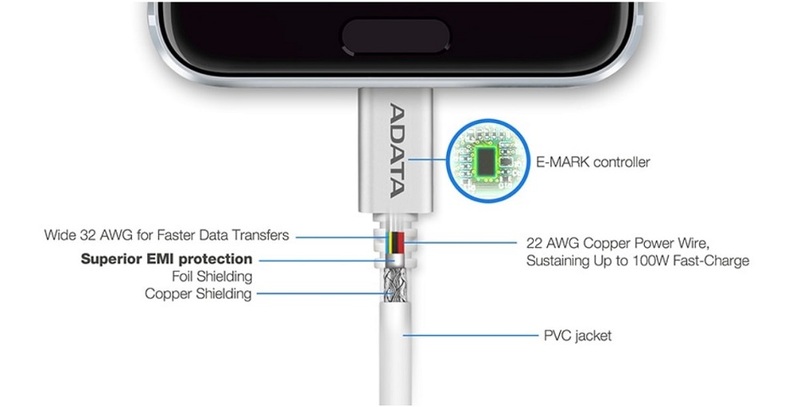 ADATA USB-C cables use a braided, multi-layered sleeve that protects internal wiring from damage while preventing signal loss and interference. The outer layer uses highly elastic PVC, resisting deformation and damage due to twisting, bending, or pulling. The premium connector is tested to a minimum 10,000 insert/remove cycles for a prolonged service lifespan.